If there is anybody that could have pulled it off I would put my money on Holmes. Clever, devious and had sufficient funds for bribes apparently. I could also see Holmes being the type to have been the Torsoman, if circumstances would have allowed him to have been in London at the correct time. Apparently something similar had been pulled off before in Georgia. Huh! That's a weird story, Jerryd. Any idea if the authorities ever had to make a decision about Pickett's status? In 1900 the Texas millionaire William Marsh Rice was poisoned in New York City by his secretary guided by a crooked lawyer named Albert Patrick. Patrick was eventually tried for the murder and convicted for murder in the first degree, but using money from his in-laws he got the sentence delayed and delayed (eventually he would get it reduced, and then probably bribed Governor John Dix to pardon him around 1910). But at one point Patrick noted that his delaying technique had left a small gap in which, he should have been executed. He actually had the brass cahones to suggest due to his gap, he was technically executed and dead, and should be released as he was "legally dead". The state naturally rejected this idiocy. Later, the crime historian Edmund Pearson wrote of the case, and suggested that the state could have shown a sense of justice and a sense of humor, ordering the burial alive of Patrick (as he was "legally dead". Too bad they could not have done that with Holmes. By the way, William Marsh Rice was the man, whose millions, founded Rice University in Texas. The only way that body isn't H.H. Holmes is if it was stolen. 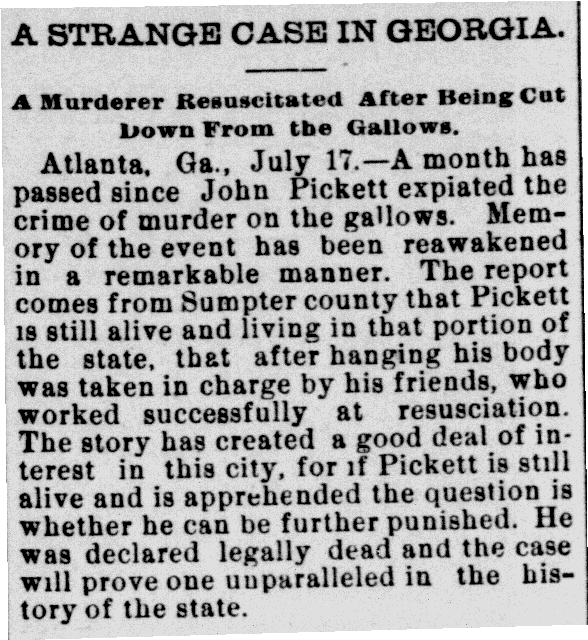 I don't think that Georgia case from 1889 is him either. H.H Holmes usually killed for profit of some sort, or I should say made some financial profit from his Killings. I guess he wanted to be paid for his work. The DNA test results are in and its a perfect match for Jack the Ripper.